I’ve been really getting into repurposing clothes of late. Never mind that I have piles and piles of fresh fabrics all waiting to be made into nifty new outfits. But the one problem with sewing is that it does create a fair amount of waste. I have tons of scraps that I’d like to do something with besides throwing them out. Then there’s the problem of all the clothes that we wear out around here. You can’t give ragged shirts to Goodwill or others. They can’t sell them. And I’ve had a heck of a time trying to find out if they can send what rags they get to fabric recyclers. But when I’ve messed up a project (a fairly frequent occurrence), what do I do with the fabric that should have been a shirt or a pair of pants? 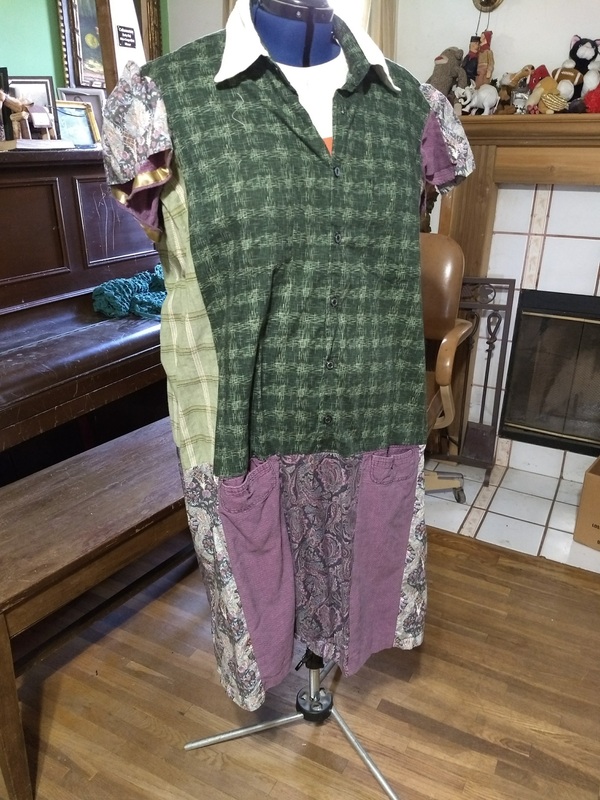 One option is to turn those fabric scraps and old shirts with ragged collars into a new garment. In this case, I experimented with a dress. 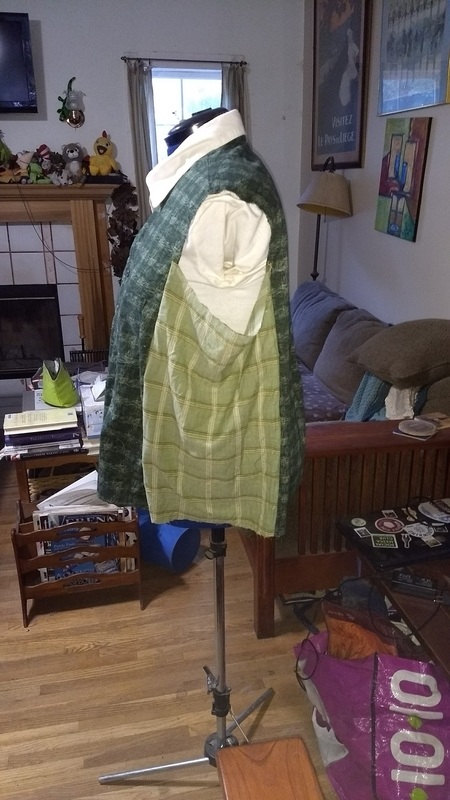 I’d also gotten a quick lesson in draping a pattern, too, which gave me some confidence to give it a try. I used for my base a shirt I’d made for my husband, or it would have been for my husband if I hadn’t made the neck way too big. I decided to leave the front and back intact for style reasons and to avoid having to sew in new buttons. The other fun thing I did was take an old shirt that already welt pockets and use that for my waist pockets. Because I’m not going to make anything that doesn’t have pockets.